Your individual sailing trip. We offer well tended yachts until 22 m for small to medium seized groups. We do not provide mass events on sailing yachts and catamarans. It is our pleasure to offer them also exclusively for you without any other guests. Enquire without any commitment and we will come up with a tailor made offer for your sailing trip. We offer the ideal ship for your major family celebration, business event or incentive, company or club outing or wedding. 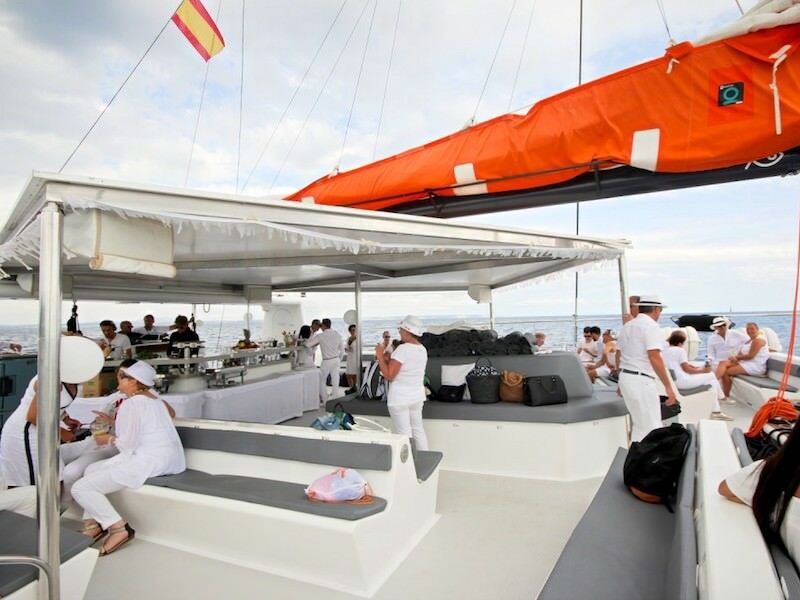 We support you in organizing the event, including catering, transfer or additional Aqua-Activities while anchoring in one of Majorca’s nearby bays. Please, enquire without commitment. The “Flagships” on our list really offer space for up to 100 – 140 guests. Due to our year long experience in this area and our good local connections, we can assure you of professional planning in the run-up as well as a smooth flow on the day of the event. Just talk to us, and we will provide advice without commitment. Have you not been strolling some time ago along the promenade of a marina on Majorca – maybe in Palma or in Puerto Andratx – admiring the beautiful yachts and wondering “wouldn’t it be nice to go on a sailing trip in Majorca?” We do understand this desire, because our passion is precisely sailing around Majorca. And we can make this wish come true. Sailing in Majorca is fun, as the wild romantic nature of the island and her coastline are so diversified. Wouldn’t it be great to travel to the most northern tip of Majorca and enjoy to see the Cap Formentor lighthouse? Near Cap Formentor is a marina. Your day trip could also start in Palma or Puerto Andratx. The harbour of Puerto Andratx is a very nice destination, and maybe there would be time for a trip to the famous dragon island, La Dragonera, off the south western tip of Majorca. The harbours of the east coast make pretty destinations, too. For instance, if you go ashore in Porto Cristo, you can visit the spectacular dragon caves (Coves del Drac). 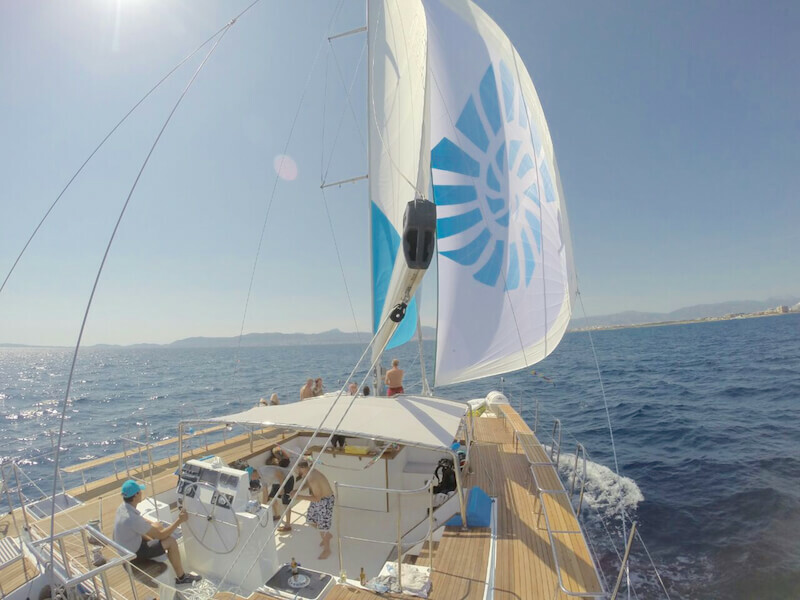 What is for sure: after your sailing trip you will see Majorca from a different angle. We are an agency specialized on charter of yachts and catamarans on the Balearics, especially in Mallorca. Our offer for day charter excursions is comprehensive and is being amplified regularly. We have been operating in this area for many years and are very familiar with our local Charter Mallorca partners and the local conditions, as we are regularly present on Mallorca. This is why we can attend to our customers in an optimal way locally and support their planning. Your Mallorca Excursions: it is our pleasure to advise you on planning your celebration, incentive or company event. 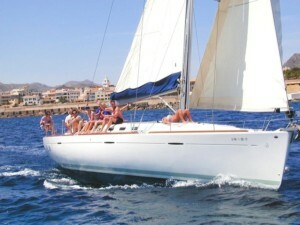 Catamaran sailing, ideal for everybody feeling uncomfortable on an “inclined” yacht. Catamarans are always in an even position and basically cannot turn over in the local conditions of wind and weather. We are a German company with local partners. This way we are able to offer you all the resulting advantages: German contact people with good English, confirmation of your request, bill. As the market of day charter offers changes permanently, due to our presence there we are able to react quickly and offer you always an up to date, comprehensive offer of available yachts. You wish to plan an event on water and do not only need the corresponding boat but also professional help for organization ? Our local network will support you. Only a satisfied customer will be a returning customer, and so we can look back on many years of successful business with a countless number of satisfied customers. You could not find the right boat? You need help with the search of the right boat for yor holidays? On this website we offer our day catamarans, ideal for your private celebration or company event. Offer your guests something extraordinary, not just a visit to a restaurant, but a day on sea. Enjoy Mallorca´s beautiful coastline from the sea perspective, swim and snorkel in the glass clear waters of Mallorca`s natural dream bays, and afterwards be pampered culinary by the crew. The relaxed atmosphere on board, wearing bathing or sports gear, creates a feeling of community, like “ everybody in the same boat“. Clear blue sky, turquoise waters and good food and cool drinks will certainly make everybody feel great. We are happy to help you plan your party, your incentive or your company event. We advise you regarding the “right“ ship for your occasion, because we know all the ships on offer “personally“. We help you organize transfers and also the catering on board. In some of the offers there is the option to book additional “fun activities“. We prefer to comment on details with you personally or send you an individual personal offer.